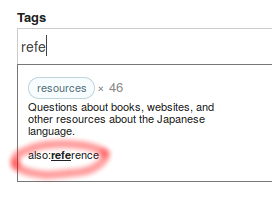 This is a follow-up of Should tag descriptions be prefixed with their kanji/kana equivalent?. For accessibility for native Japanese speakers (as well as for learners), I think it would be nice to provide a Japanese translation of our tags, for example right at the beginning of the "tag excerpt". 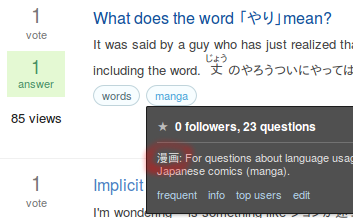 The (first few words of the) tag excerpt appear next to the tag when adding the tag to a question (picture above). If the tag excerpt starts with a Japanese translation of the tag, it will be seen by anyone adding the tag, or hovering over the tag (picture below), or doing anything else with the tag. For tags that are already a romanized Japanese word (like kanji or rendaku), this is a no-brainer, but other tags (like orthography or words) need to be translated properly, preferably by native speakers. Update. This was implemented a while ago. Not the answer you're looking for? Browse other questions tagged discussion status-completed tags tag-wiki . Kanji tags - now available! Should tag descriptions be prefixed with their kanji/kana equivalent? Should we start using Japanese tags? 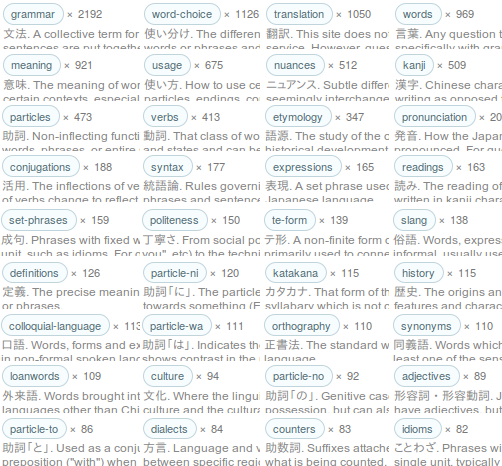 Should we merge the “homophonic-kanji” and “kanji-choice” tags? Is closing this as a translation request an over-reaction?